Sharing the same name as his “funky, rollicking, lively” (Music Row) new single, which name-checks his predecessors and country music icons Merle Haggard, Willie Nelson, Joe Diffie, George Strait, Alan Jackson and Hank Williams Jr., Chris Young’s “Raised On Country Tour 2019” will kick-off May 16th in Alpharetta, Georgia. The first leg of the tour will include over 25 shows from coast-to-coast through September. Markets include Charlotte, Boston, Philadelphia, Dallas, Las Vegas, Indianapolis, St. Louis, Phoenix, San Diego and more. Young will be joined by special guest Chris Janson as direct support along with Dylan Scott, LOCASH and Jimmie Allen. Last year on the road was incredible and I’m crazy excited to get back out there with new music and the ‘Raised On Country Tour’ and to have Chris Janson, Dylan Scott, Jimmie Allen and Preston and Chris from LOCASH join me on tour,” said Chris. 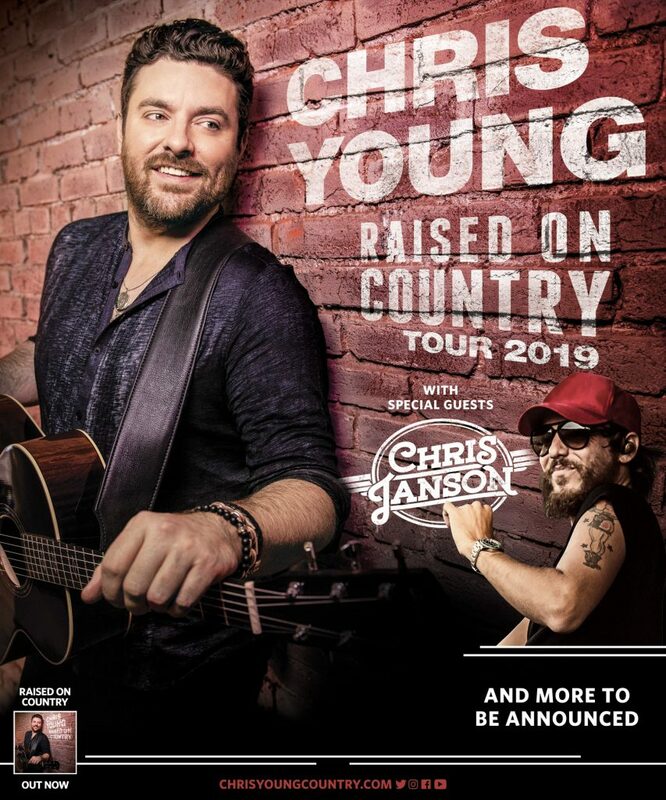 Tickets for Chris Young’s “Raised On Country Tour 2019,” promoted by Live Nation, go on sale beginning February 15th at 10:00 am (local time). Citi is the official presale credit card of the Chris Young tour. For complete presale details visit www.citiprivatepass.com. Find a complete listing of tour dates, including additional Chris Young concert stops for 2019, VIP package details and purchase tickets at ChrisYoungCountry.com.